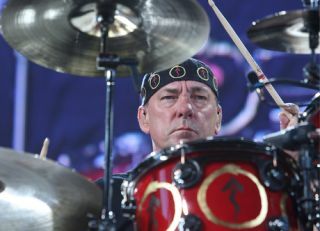 Rush will release a new documentary DVD and Blu-ray this summer. Beyond The Lighted Stage traces the band's 40-year history and is out on 5 July. Directed by Scot McFayden and Sam Dunn (whose credits include Iron Maiden: Flight 666 and Metal, A Headbanger's Journey), the film features all kinds of musical heavyweights, including Taylor Hawkins, Gene Simmons and Trent Reznor. There's also a host of bonus goodies, such as live tracks and pre-gig footage. Beyond The Lighted Stage will receive its UK premiere in London tonight. We'll be there and will post a review of the movie later this week.